Old-fashioned taste in a simple, easy-to-make dinner. 1. Prepare stuffing mix according to package directions; set aside. 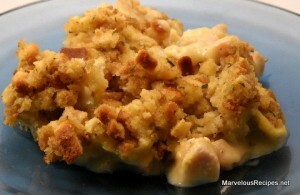 Grease a 13×9-inch baking dish; place chicken in bottom of dish. 2. In a large bowl, mix together the soups, milk, celery, onion, salt and pepper; pour over the chicken. Top with the stuffing. 3. Bake, uncovered, at 350 degrees for 30 to 35 minutes or until bubbly. Makes 6-8 servings.